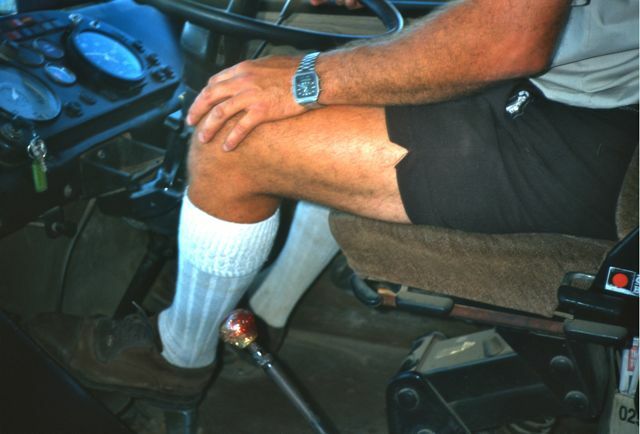 Kakadu camping is more sophisticated than you might think. 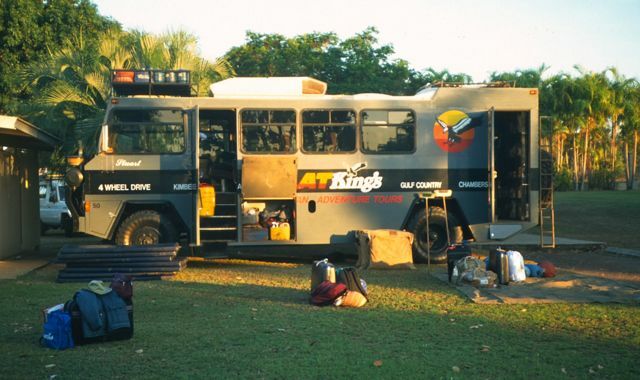 We traveled in a self-contained, Mercedes-Benz military-type RV, custom-designed for this kind of adventure. 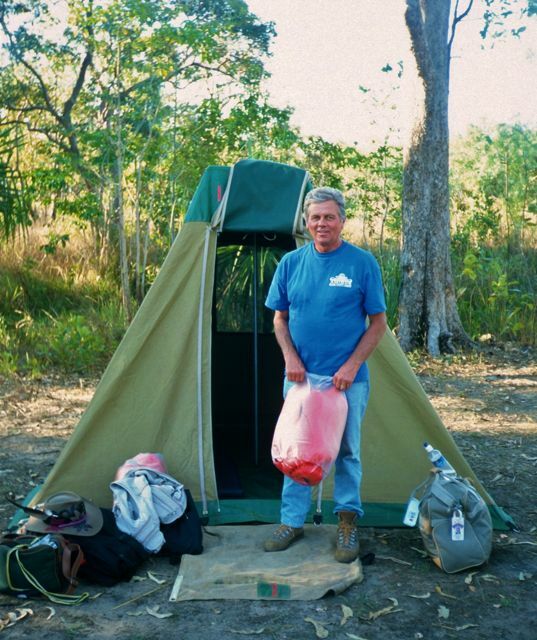 One third of the back end stored tents, tools, sleeping bags, sleeping mats, luggage, food and water. 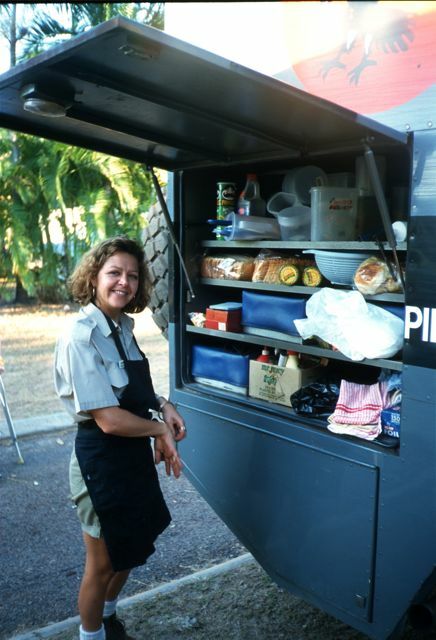 One side of the vehicle flipped down to become a cooking area for meal preparations. 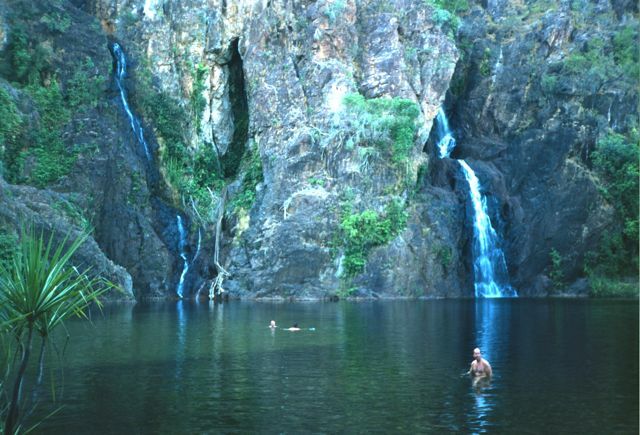 One of our first stops was to swim at Wangi Falls, where parts of the movie, “Crocodile Dundee” were filmed. Everywhere there is water we see BIG crocodiles. 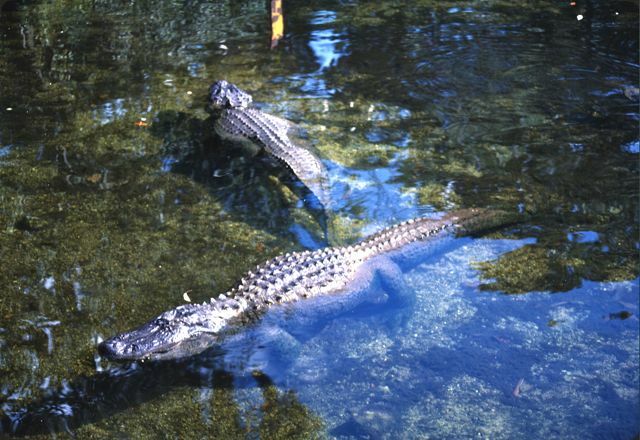 Interestingly, one of the pontoon cruises we took was on a waterway called the East Alligator River. 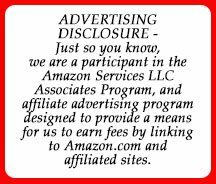 Every day was a new adventure in this vast (20,000 square kilometers) National Park—also called Arnem Land—full of rivers, plains, wetlands and escarpments abundant with wildlife. 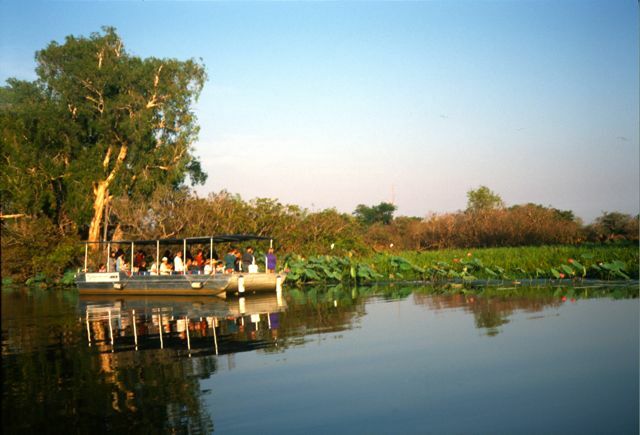 In a covered pontoon boat we explored the Yellow Water Billabong. 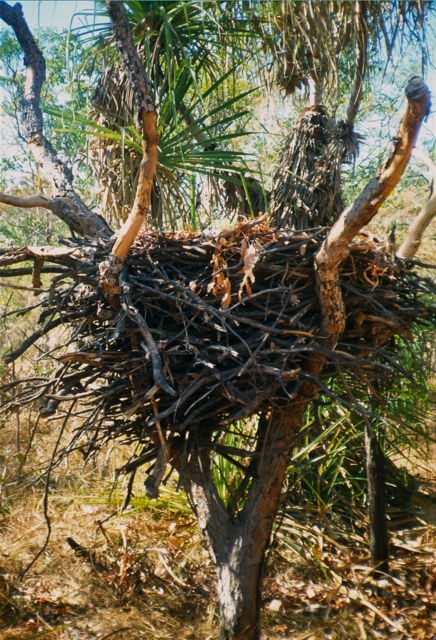 A billabong is a body of water—not always small—that appears in a a creek bed or low area only during the rainy season; as floodwaters dry up seasonally so usually does a billabong. 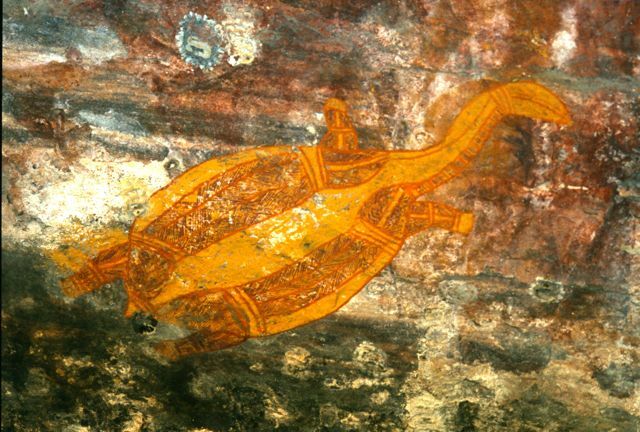 The word originated in a native Australian language from the words billa for river and bong for dead. 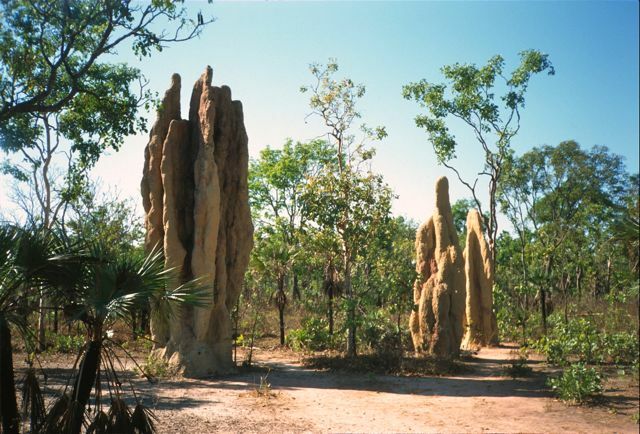 In open areas, termite nests grow to become huge, impressive towers. 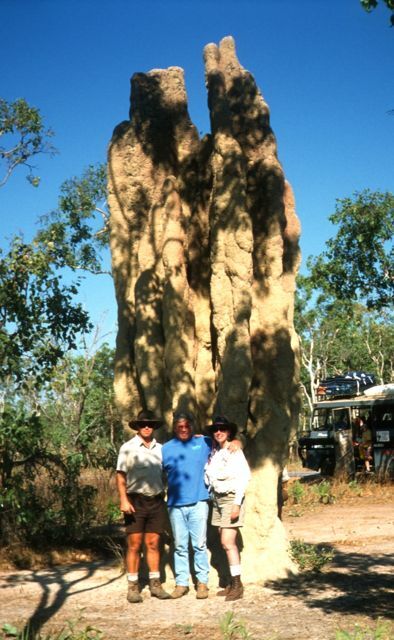 Our guide Steve, posed with us in front of a typical Australian termite nest in this area. 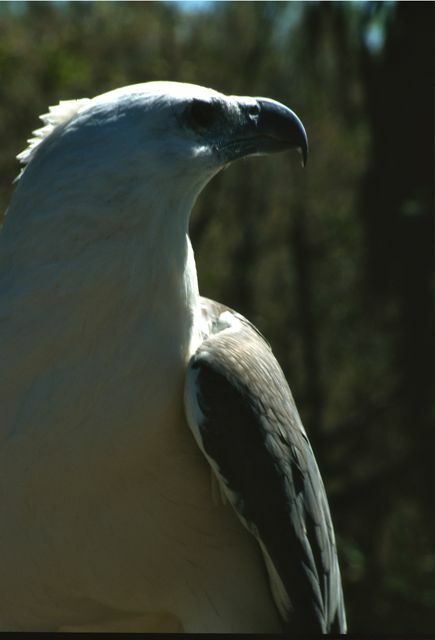 A highlight was a visit to a sanctuary for endangered White Sea Eagles. From the top of Ubirr is a stunning view of the wetlands and escarpment country below. 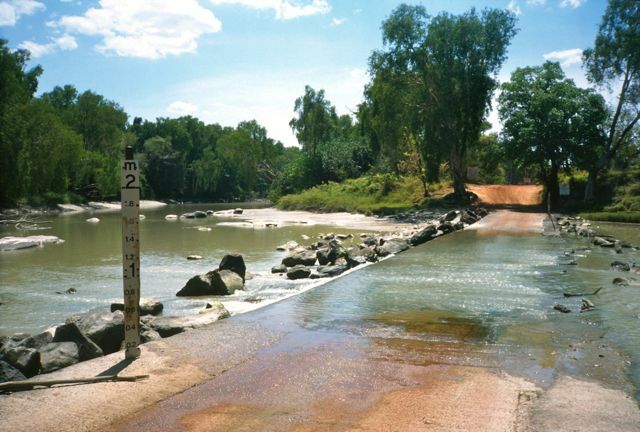 It’s common to see roads like this flooded at certain times of the year. 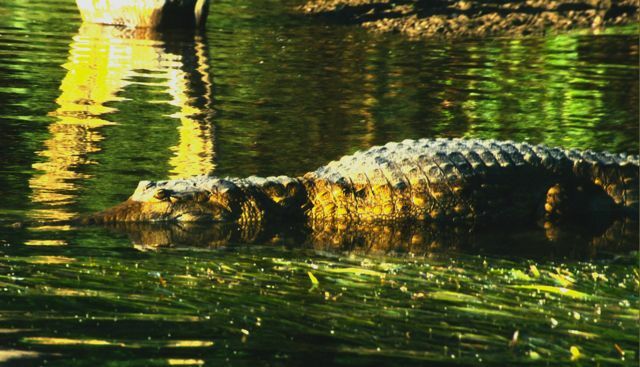 This can be dangerous for Aboriginal residents as crocodiles may be in even the shallowest water. Monsoon rains alternately flood the plains, turning them green after the sun that scorches it dry. This area is actually called The Monsoon Forest. 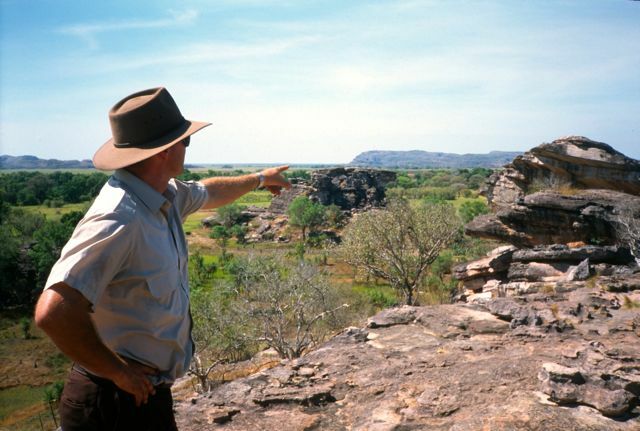 This part of Kakadu, called Arnhem Land, is entirely owned by Aboriginal people who maintain a strong indigenous culture here. 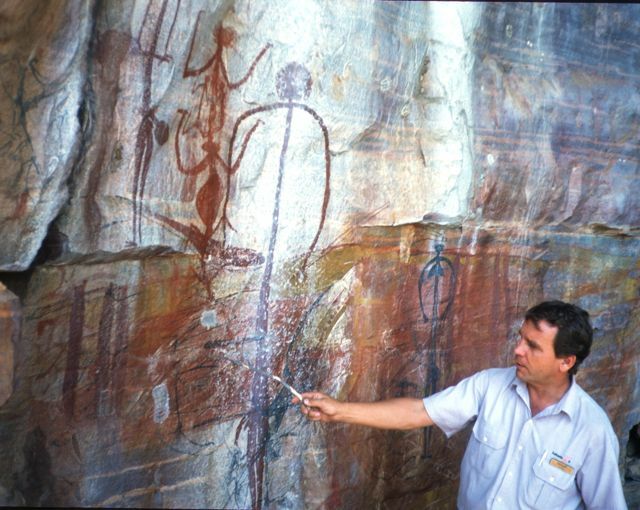 Steve points to rock art dating back 50,000 years. 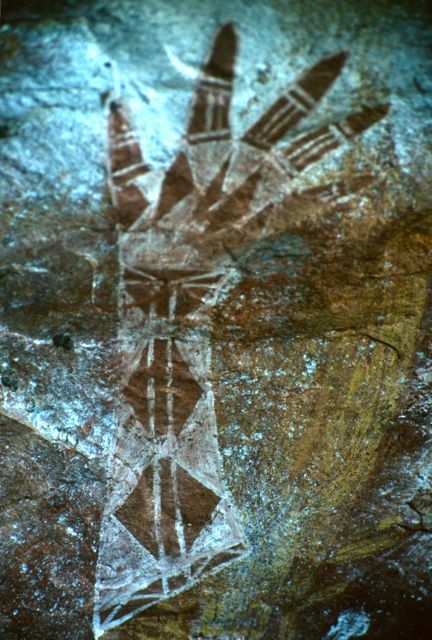 Kakadu has the highest concentration of Aboriginal rock art in Australia. We hike around Ubirr to see these petroglyphs. 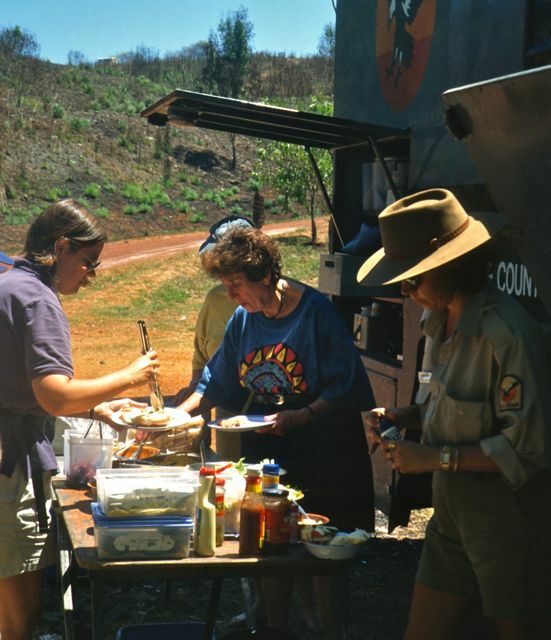 Lunch is served buffet-style from the side of “Huey” that serves as Robyn’s kitchen. 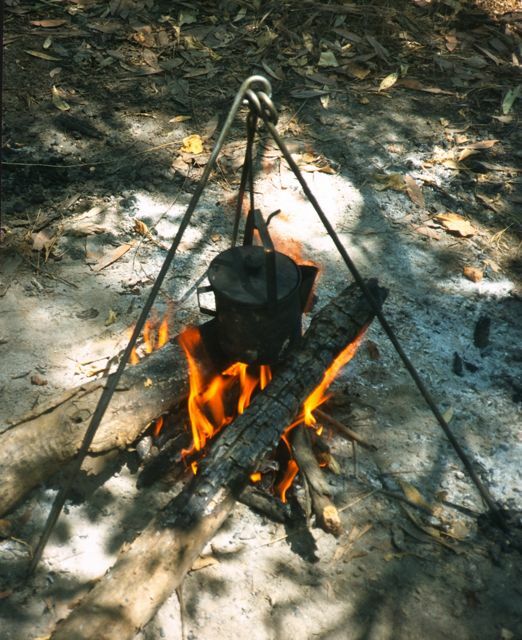 Steven and Robyn make tea the “aboriginal” way. 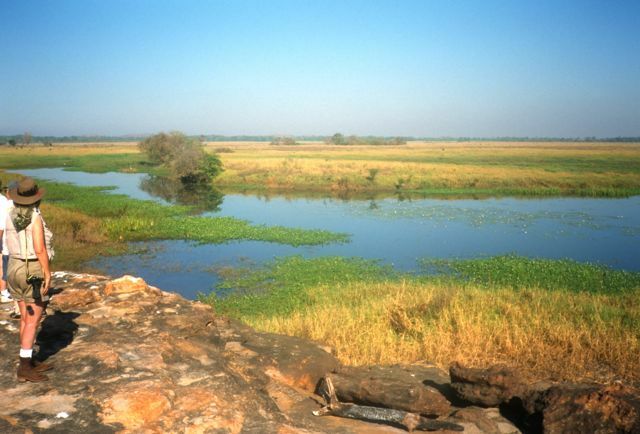 Australia’s Kakadu National Forest is one of the world’s largest great conservation reserves.